I did this walk on Sunday 21st November 2010. 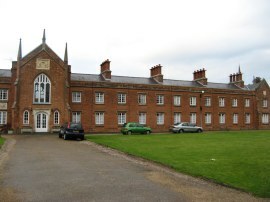 I drove up to Saffron Walden where I parked in the large car park off New Pound Lane which is free to park in on Sundays. 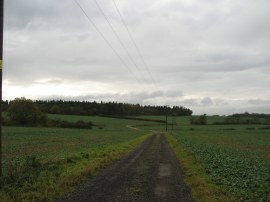 I then got ready to set off back to Butlers Farm to resume my walk along the Harcamlow Way. 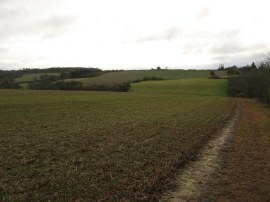 From Butlers Farm I headed to the right along a farm track, photo 4, that runs between fields towards a patch of woodland. 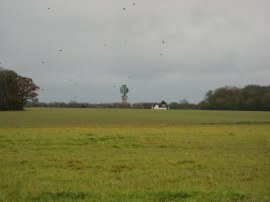 On the map the route is marked as heading diagonally across the field to the far right hand corner of the trees however there has been no sign of the footpath on the either of the occasions I have walked here and it is a far easier alternative to follow the farm track as it bends round the edge of the woodland. Leaving the trees the footpath heads along the track in photo 5, which runs over the top of the low hill to give the first views over to Saffron Walden. At the end of the field the route heads to the left along the field edge before turning right to follow the field edge downhill towards the town. Leaving the fields the route joins Sheds Lane, heading downhill between houses. 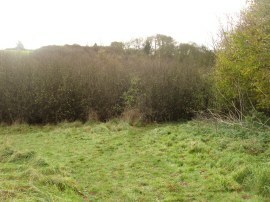 At the end of Sheds Lane the route continues ahead along a short stretch of footpath to Pound Walk. Reaching the end of the road I headed to the left along Common Hill, following the road past a park and into the centre of town. 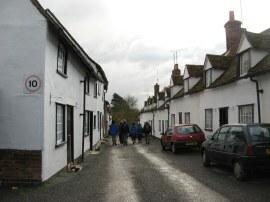 At the bottom of the hill the Harcamlow Way follows the road round to the right to head along Hill Street, photo 6, before crossing the High Street into Abbey Lane. This was a rather odd choice of route through the town as it missed the majority of the nice buildings in the town. 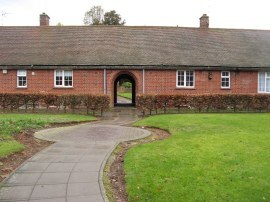 Heading down Abbey Lane the path passes by the Saffron Walden Almshouses, photo 7, then heads through a set of tall metal gates into the grounds of Audley Park, following a path that bears to the left across the parkland, photo 8. 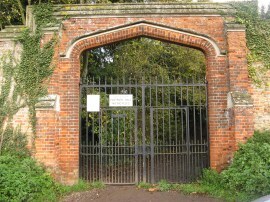 Once over the park the path leaves the park through another set of metal gates, photo 9, to join Audley End Road. 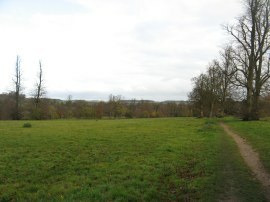 The Harcamlow Way heads to the right down the road, the footpath running alongside a long brick wall, photo 10, that runs along the edge of the park. 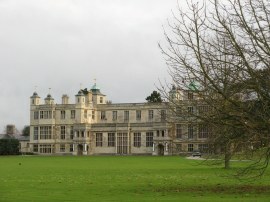 After a while the route joins a lane on the left however I continued a little bit further down the road to the entrance to Audley End House so I could take a photo of the building, photo 11, which looks out over grounds landscaped by Capability Brown with River Granta flowing through the middle. 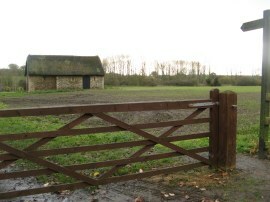 Having seen the house I then retraced my steps back up to the lane and headed through small hamlet of Audley End, photo 12, where I overtook another group of walkers. 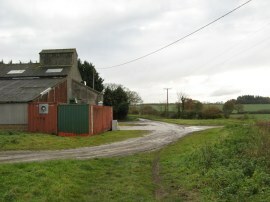 The Harcamlow Way joins a driveway on the left that bends round the buildings of Abbey Farm before crossing over Wenden Road and continuing ahead along a field edge bridleway heading towards the B1052 Newport Road, photo 13. 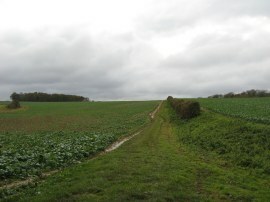 After a while the route splits from the bridleway, heading slightly to the right to run along a hedge and tree lined track between the fields with a brook to the left before climbing a short slope up to the road. Once again the route heads straight across the road the path running through a band of trees alongside the brook. Reaching a field, the map shows the route of the path continuing ahead along the right hand field edge although a far more prominent track runs alongside the left hand edge of the narrow field which is the route I followed to Brakey Ley Wood and looking back I saw that the walkers I had passed also followed this route. 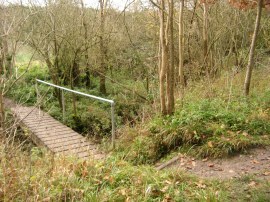 The path then follows the edge of the trees round to the right, crossing over a small footbridge over Fulfen Slade. Leaving the trees the path crosses over another slippery wooden footbridge before continuing ahead on a path that heads gently uphill between fields, photo 14. The path then bears to the left across the top of the hill where to my left I could see the radar, photo 15, and to the right, at the bottom of the valley, the village of Newport. The Harcamlow Way has a figure of eight route and I was now nearing the point where the two loops intersect. From the hill top the path bends round to the right by the trees of Rosy Grove and then starts descending down alongside the field edge, photo 16. 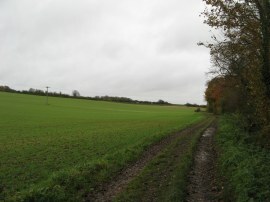 Reaching Bromley Lane, which is hidden in the bottom of the valley, I reached the junction of the paths, photo 17. Heading to the right the two sections of the Harcamlow Way share their route for a few yards, along a stretch of path I had walked on stage 5 of my walk round the Harcamlow Way back in early April. This time my route however soon headed off over a bridge over Debden Water, photo 18, where I noticed that the river was actually dry, unlike back in April. 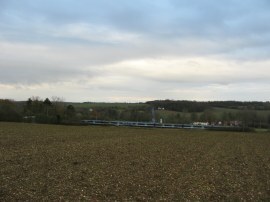 Once over the bridge the route crosses over a small field and then has a bit of a trudge up the other side of the valley through a small patch of woodland before joining a hedge lined path running between fields to a road. Crossing the road the route continues ahead along a footpath that runs alongside a low green fir hedge, although the entrance to the footpath from the road was somewhat obscured and I managed to walk past it twice without actually spotting where it was. At the end of the hedge the route follows the edge of the field round to the right, heading along the field edge towards some houses where the route turns to the left. 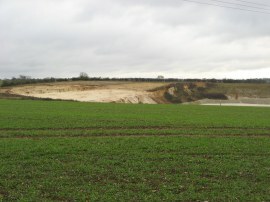 Ahead of me I could see a large chalk pit, photo 19, which I had walked alongside on my way to the start of stage five but had not been able to see. 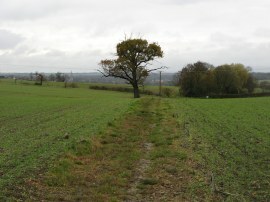 The route soon heads to the right again to join a path that heads downhill between fields towards Newport. 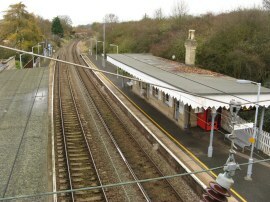 Reaching a lane the Harcamlow Way heads to the left for a few yards before heading to the right to take a footbridge over the railway lines by Newport Station, photo 20. 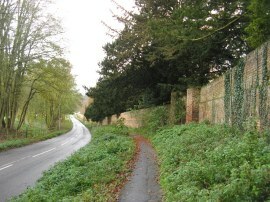 The path then heads up Station Road and crosses the B1383 into Frambury Lane. Half way up Frambury Lane the route is shown as joining a footpath that runs between houses however I missed the exact route of this path and took a rather circuitous route through the housing estate up to the top part of Frambury Lane, a better option would probably be just to stick to the road itself. From Frambury Lane I then headed down a short section track between the houses on the left that soon leads out to a field. After crossing the field for a few yards the path heads into a band of trees which the path runs through the middle of, heading downhill and bending to the right to reach the B1038 Wicken Road. Here I headed to my left along the road to pass underneath the M11 motorway. Once under the road the route heads a few yards to the left along a byway running parallel with motorway before turning right along a short stretch of tarmac that runs past a house to reach a footpath on the left, close to St Helen's Chapel, which was where I finished this stage of my walk along the Harcamlow Way, photo 21. At this point I had walked a further 8.1 miles along the Harcamlow Way. I then retraced my steps back under the motorway before joining a footpath on my left that runs alongside the edge of Wicken Water and round a patch of trees to reach Bury Water Lane on the edge of Newport. Crossing over Wicken Water I headed to the right along the road for a short distance before joining a footpath on the left that heads up alongside school buildings and then playing fields. 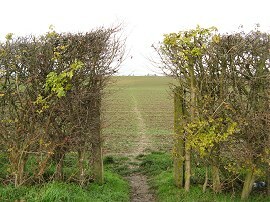 At the end of the playing fields the route passes through a gap in the hedge and heads out over the middle of a large field, photo 22. On the aerial view in Multimap a clear path is shown heading across the fields but when I was there the field had been recently ploughed and there was no evidence of the route across the fields and the few footsteps leaving the gap in the hedge soon faded away. The damp mud stuck to my boots in ever greater quantities as I made my way over to the far side of the field. 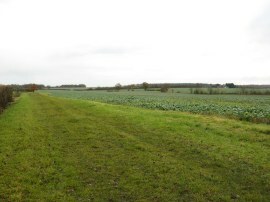 The route was running parallel with some train tracks and as I neared the end of the field I could see the B1052 road which I would soon be walking along heading off to the right, photo 23. At the end of the field I headed to the right, crossed over the railway lines and then headed over the middle of a small grassy field down to join a road. The grass in the field was quite long a did a good job in clearing most of the mud off my boots ready for the long walk up the B1052 road into Saffron Walden. 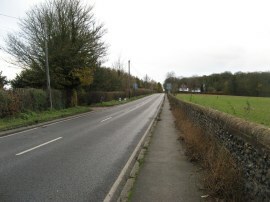 Normally I would avoid such a long stretch of road walking however there were no convenient alternative footpaths and I had checked earlier in the day that there was a pavement alongside the road. 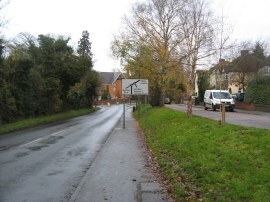 The start of the road crosses over the River Granta and is called Sparrowsend Hill, photo 24. 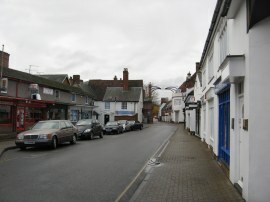 Later as the road nears Saffron Walden becomes the Newport Road. At least as I could keep up a decent pace as the road headed up and down between fields and 1.7 miles later I arrived at the end of the road, photo 25. From there I joined a footpath that runs between houses back to Abbey Lane where I turned to the right, heading back past the old Almshouses before joining a footpath on the left which heads through the middle of a low rise building, photo 26, to Park Lane. From there it was just a very short walk back to the car park. Reaching the car I had walked 15.5 miles in total. Having crossed back over the middle of the route I now just have the last quarter of the path to complete which hopefully will not take much longer. For the first time ever I had uploaded a copy of my proposed route to my GPS before I set off and it had been fun following the route between the waypoints. Until I revised my route back to the car, (I had originally been going to do a longer walk), I was able to keep my map in my rucksack all day. Of course change the route mid walk highlights how important it is to have a map to refer to but it had been nice to navigate in a different way and not have to have the map in my hand all day. 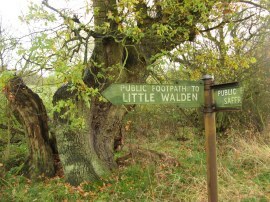 I have uploaded the route of the walk which can be accessed here Harcamlow Way 13 Route.